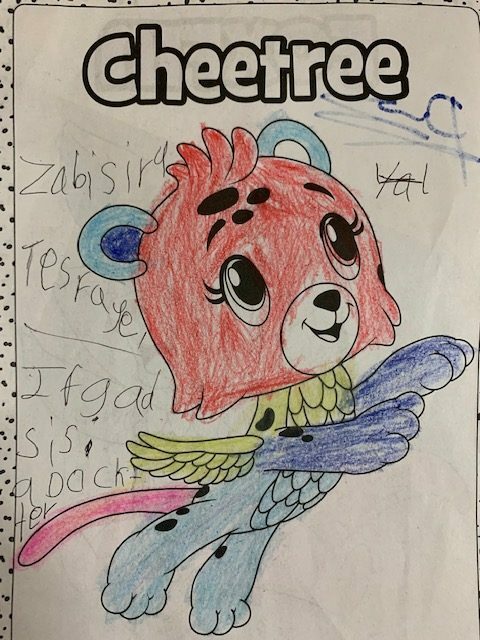 Kalkidan and Zabisira – Day Brighteners! Ethiopia is full of contradictions: a beautiful and also a difficult place. I walked two blocks today from the hospital to what I thought was a print/copy shop make copies of medical forms. In that two blocks, I saw examples of extreme poverty, destruction, and need. Even at the “copy shop,” which was basically an 8′ x 8′ open air room with a a dirt floor, the employee didn’t know how to operate the small printer on a table in the middle of the room. But also along the way, I was met with smiles and people willing to help me find my way. When I reached the shop, a little girl smiled shyly up at me. She was beautiful. By the time I left, there were four girls and three boys crowded around the doorway, smiling and very curious about me. We had a great time taking pictures together, and then they followed me most of the way back to the hospital. I smiled the whole way. At the new hospital, people often travel hundreds of miles to be evaluated by medical staff, either ours or theirs, or both. They sleep in every available space, and wake each day with renewed hope and persistence to get the care they need. It can be disheartening to see so much need, and to come face-to-face with the knowledge that it’s impossible to help them all. That’s the reality, and it can be a hard pill to swallow. 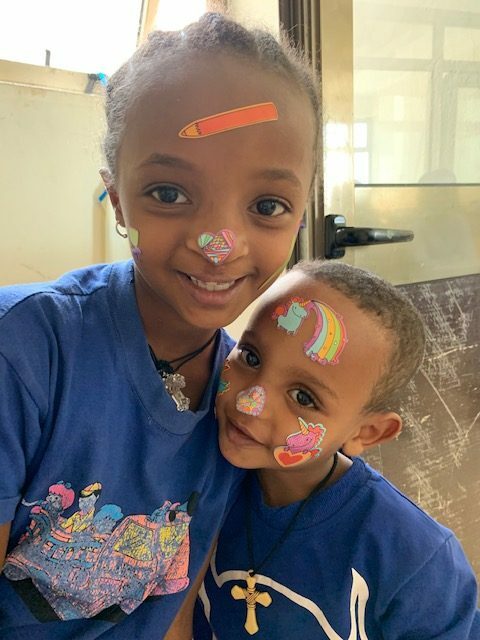 And then I met Kalkidan and Zabisira, two little girls with huge hearts, immense joy, and incredibly giving spirits, both on our schedule for cleft surgery. They breezed into our pre-op area, smiling, dancing, and blowing kisses to us all. 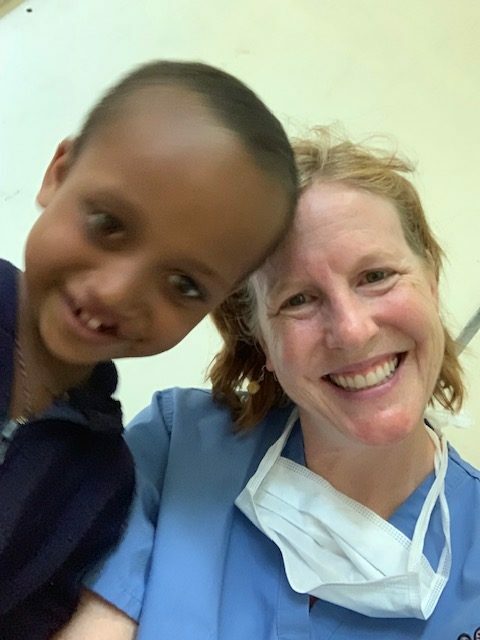 Sure they were nervous about surgery, but they didn’t let that stop them from making connections with every person they met. Having each girl willingly put one hand in a nurse’s and the other into mine, smiling up at us with trust and love…. just because. The beauty that shines through each of these girls transcends language, place, and the harsh surrounding conditions. Being around such beauty makes this trip wonderful, and I’m so privileged to have met both girls. 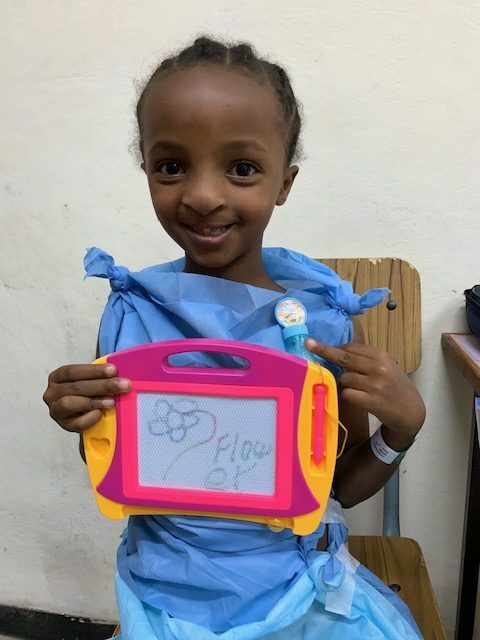 Zabisira, who is 8, wrote that she wants to be a doctor.